My name is Megan Brown and I have just started my role as a Beef Extension Officer based in Rockhampton. I live on a small property at Alton Downs near Rockhampton. 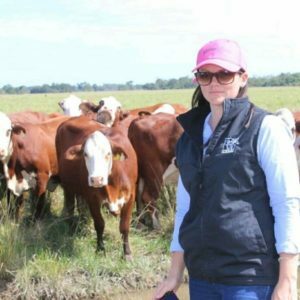 I was born in Warwick, Southern Queensland and grew up in the New England, NSW where my passion for cattle and agriculture developed. I studied a Bachelor of Applied Science at University of Queensland, Gatton majoring in Production Animal Science before starting work in the cattle biotechnology space. For 5 years I worked as an Embryologist and Lab Manager for a cattle IVF and Embryo Transfer company and was involved with both stud and commercial, beef and dairy herds. In this role I also spent several months working in China with dairy systems. From here I moved into the role of QLD/NT Technical Sales Manager for Boehringer Ingelheim Animal Health. As part of the Vet Specialist Team my main focus areas were reproduction, artificial breeding in extensive northern beef herds, breeder herd management, pain/wellbeing management for husbandry procedures, Antimicrobial Resistance (AMR) and mastitis treatment. I worked closely with the veterinary community, pastoral companies and producers in new product adoption along with management of herd health and wellbeing. In 2017 I hosted a beef production study tour of Argentina for Australian vets and producers. Currently I am completing my Graduate Certificate in Agribusiness through the University of Queensland with the aim of moving into a masters or PhD in northern beef cattle reproduction.